Banking giant JPMorgan Chase has landed in the national spotlight for its abusive debt-collection practices. But this story is not new for Legal Schnauzer readers. I've been reporting for almost a year about Chase's involvement in the personal debt-collection nightmare my wife and I have experienced. I've presented tape-recorded evidence and transcripts of telephone calls that show Chase and its affiliates repeatedly violated federal law in an effort to collect a credit-card debt they could not prove I even owed. We've reported on allegations in a federal lawsuit that Chase played a prominent role in cheating my wife out of her job at a Birmingham-based insurance company. We soon will be presenting evidence that Chase and affiliated lawyers have attempted to corrupt the federal-court system in the Northern District of Alabama. Now, it appears Mrs. Schnauzer and I are not the only ones fighting back against Chase and its rogue debt-collection network. The attorney general of California last week filed a lawsuit, claiming Chase resorted to unlawful tactics in an effort to collect alleged debts from some 100,000 credit-card holders in the state. Meanwhile, the U.S. Office of the Comptroller of the Currency, one of the bank's chief regulators, is preparing an enforcement action against Chase over the way it collects credit-card debt, according to a new report at The New York Times. You can be certain the Schnauzer household will make sure that officials in California and D.C.--and anywhere in between--have access to evidence we have accumulated against Chase. It is, as our regular readers know, voluminous and irrefutable. Chase's use of illegal robo-signing was “widespread,” Harris' office alleges. The practice involved automatic signing of various documents--some sworn--without reviewing the paperwork or bank records. "Sewer service" litigation against borrowers was also used by Chase, the suit alleges. The bank failed to even notify credit card holders it was taking them to court, while Chase claimed they had been notified as required by law, Harris' office claims. What effect does this have on California courts? Chase, the lawsuit claims, effectively used California's judicial system like a "mill" to obtain default judgments and garnish borrowers' wages. The bank filed thousands of lawsuits every month from January 2008 until April 2011, the state claims. On one day alone, Chase lodged 469 such suits. Chase also sought default judgments against borrowers who were military members on active duty, the suit claims. “At nearly every stage of the collection process, defendants cut corners in the name of speed, cost savings and their own convenience, providing only the thinnest veneer of legitimacy to their lawsuits,” the complaint says. In many cases, Chase uses lies, threats, and other violations of the Fair Debt Collection Practices Act (FDCPA) to scare consumers into paying money they might not even owe. These tactics are employed long before a case reaches the courtroom phase, and my wife and I have experienced them firsthand. Several layers of bureaucracy often clog a path that flows from Chase to a consumer. In our case, collectors from the Birmingham law firm of Ingram & Associates communicated directly with us. Evidence in our FDCPA lawsuit showed that Pennsylvania-based NCO placed the alleged debt, from an American Express card, with Ingram & Associates. And JPMorgan Chase, via an investment arm called One Equity Partners, owns NCO. Evidence in our case also showed that Ingram & Associates had no documents to show I even possessed an American Express card, much less that I owed a debt on one. We also have presented transcripts that illustrate the misconduct in black and white. The California attorney general is focusing on debt-collection abuses that are designed to cheat consumers in courtrooms. But many consumers cave in to unlawful threats and harassment long before their cases ever reach a courtroom. In fact, evidence strongly suggests that Chase and other collectors engage in such strong-arm tactics because they know they don't have documents to prove a case in court. America became and is, the biggest liar in earth. Shock and Sham, a book written by a non-American. 9-1-1 was to cover up the biggest liars in earth: Federal Reserve System [Fed] and Wall Street's "Desk Drawer Corporations" - CHASE and every so called "bank" in America. There is no such idea, "money" other than whatever gets made up to be a commodity of exchange. There is a contract, that has to be agreed upon. But, in George W. Bush, Jr. and Barack Obama Barry Soetero and others' new-old world, the power of nuclear winter threat is a great big hammer. Take the American flag and wrap the whole earth in the stars and stripes and then choke the life out of life, the global government worships death. 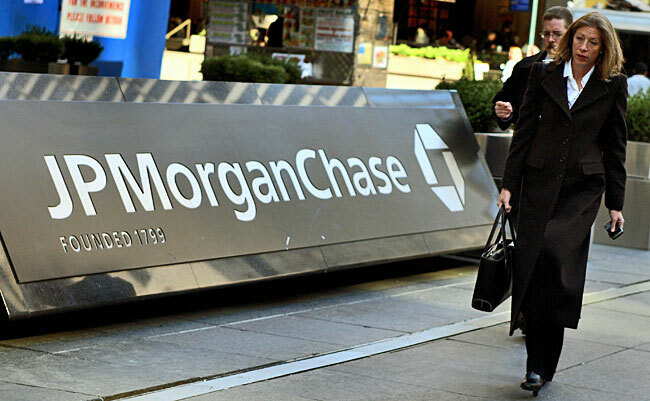 CHASE was JP Morgan that was, and is, the beginning of FRAUD Maximum USA. As indictments begin, your blog Legal Schnauzer is historical. ALWAYS the greater spirits in earth have the last say. Bye-bye Rockefeller Agent for Rothschild global gov fraud. Thanks for flushing the filth in the historical toilet, LS. Elizabeth Warren, and The House On Government Reform, Elijah Cummings. Kudos to the AG of California. Here in Alabama, our AG is too busy attacking legal gaming sites to worry about banking scams. Kamala Harris is a Dem, and she is mighty easy on the eyes. Keep an eye on her. Could be a political comer. Love your audio on this, LS. You caught the SOBs in the act. Good job. ... The situation at JPMorgan Chase, in the run-up to its annual meeting on May 21, is an interesting test case with regard to two specific decisions: whether Jamie Dimon should continue to serve as both chief executive and chairman, and whether three members (David Cote, Ellen Futter and James Crown) of the risk committee of the board should be voted out. ... JPMorgan Chase & Co, HEAVY HITTER .. Through its subsidiary Chase Bank, the company has traditionally been one of the top consumer credit card issuers in the country .. In 2002, federal investigators launched a probe into the firm’s relationship with former energy giant Enron. Prior to the energy firm’s collapse, JPMorgan Chase had been one of the company’s largest financial backers. ... Reader E.W.F. had this to say about the gold COT Report yesterday..."The Commercials hold their smallest net short position since 09 December 2008. The gold raptors [the Commercial traders other than the Big 8] hold their largest net long position since 27 July 2010. The Nonreportable [small] gold traders are net short for the first time since 20 February 2001" .. As you can tell, a major bottom is in place. I'd be prepared to bet serious money that the largest of the Big 4 Commercial short holders in both silver and gold [and probably platinum and palladium as well] are JPMorgan Chase, Canada's Bank of Nova Scotia...and HSBC USA. The short positions of the smallest of the Big 4 traders in both gold and silver are irrelevant. It's just the Big 3...but mostly the Big 1...JPMorgan Chase. I think I understand how this works. Chase threatens you so that it can get money without going to court. If it does have to go to court, it cheats you with bogus lawsuits that it can't support. Republicans are always trying to sell us on the unfettered marketplace. Well, this is what it looks like. Looks like regulators and law enforcement are finally catching up to your reporting, LS. "We soon will be presenting evidence that Chase and affiliated lawyers have attempted to corrupt the federal-court system in the Northern District of Alabama." Kamala Harris is "hot"--even when she isn't going after JPMorgan Chase.